In August 2016, Cheyla Pettett was excited for her occupational therapy classes to begin at Nebraska Methodist College. She had relocated to Omaha to fulfill her dream of pursuing the profession. Tragically, Cheyla never got to attend classes. She was killed in a pedistrian-car accident just days before school began. Cheyla had signed her organ donor card and many people benefited from her life-saving gift. Janet Going, who had battled congestive heart failure for years, was among those recipients. 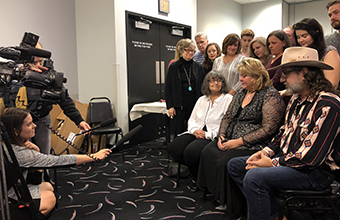 The two families were able to finally meet in conjunction with Nebraska Methodist College alumni festivities and it was a moment they will treasure forever.